Tired of having to mess around under your car to to change the oil filter? Wish it was as easy as changing the oil filter on an e34? Now, you can convert your M30b34 to use the e34 M30b35 or S38b36 top access oil filter housing! Machined from 6061 aluminum, this adapter allows you to simply remove your factory bottom mount filter housing and convert to the B35 or B36 housing. A common problem when you don't use an adapter when converting to the M30B35 housing is that the oil feed port bleeds back into the oil return port causing some oil to skip the filter entirely. The Miller B35 OFH adapter makes sure all oil goes to the filter as it should. 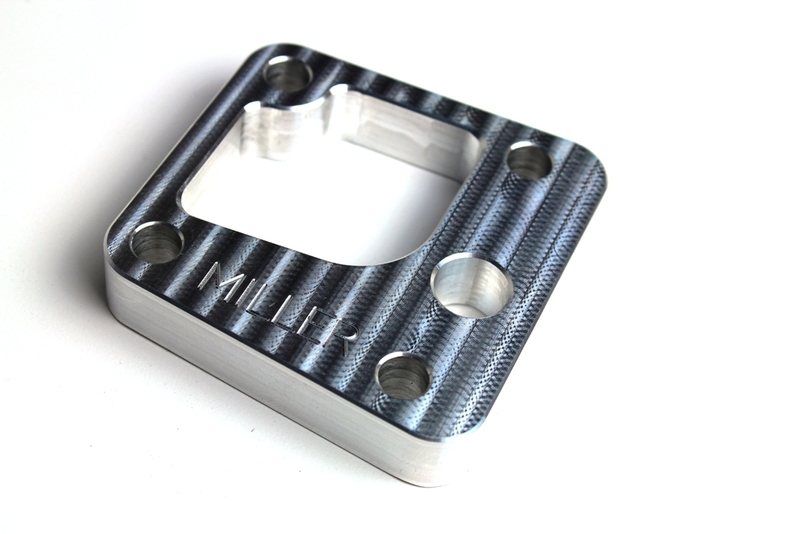 Both e34 housing types will work on an M30b34 block with our Miller B35 OFH adapter. The S38b36 housing offers built in oil cooler line ports for those that want to plumb an oil cooler into their M30 project for a near factory like apperance. The adapter also gives the needed space for the B35 and B36 filter housing to clear some plumbing that is in the way. Converting to the e34 style oil filter housing with the Miller B35 OFH makes oil changes much faster. With the top access housing, you simply remove the lid and replace the filter making oil changes easier and faster.